I was a '90s kid, already seen it. Folklore music is some of the best out there. They tell such expressive stories and in such beautiful ways and through such amazing vocals. It is such a shame so many people are deadset against expanding their musical tastes, because there is so much out there to listen to that is amazing from house to folk to hip hop to synth. Such as this song, Matty Groves. It’s just amazing. It is a book sung to you and in such and amazing way. "I’d rather a kiss from dead Matty’s lips than you or your finery"
Just out of interest which two? Metal Gear Solid, Shadow of the Colossus , Final Fantasy V and Chrono Trigger. Saying that I bet that the Super Mario 3 and Shovel Knight books are probably worth a read too. To be honest, I would read any/all of those books, heard a lot of good things about them. I recently watched The Place Beyond the Pines, and that movie was awesome. Made me cry a bit but I would definitely recommend it. I hadn’t seen this yet thank you so so so much for sharing this here! I can’t reiterate enough how fantastic Joaquim Phoenix is in terms of getting into his character’s shoes. I didn’t have that much of an admiration for him until I saw You Were Never Really Here and was totally blown away. The Batman universe being my all-time favorite comic book universe, I can’t bloody wait for this! pssst @ohko you seen this trailer yet? By trailer do you mean spoiler? I’ll watch any Joaquin Phoenix movie though; no trailer or synopsis required! Lmao why you think I tagged you? Simply faking a laugh is the most difficult thing, and he does that in so many different ways just in this trailer. I also feel that I haven’t seen a trailer this good since A serious man, put togheter with great care. 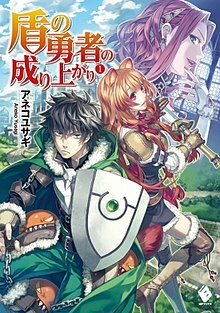 f’n hell The Rising of the Shield Hero continue to infuriate and piss me off , god dang i love that show! Is this an indrect reference to @RaccoonV? I always thought the “blue little shiny thing” is a shield. I caught up on Doom Patrol. It was a wonderful episode! Seriously I did not expect this series to be so enjoyable. haha I love Cliff and Jane so much, they make a great dynamic, but then again so does Rita and Larry. I also sat down to watch the latest animated DC movie called Justice League and the Fatal Five, bringing back the Justice League Unlimited cast. Oh man it was SOOOOO good. It brings back positive vibes to see my crew back guys. And to see Wonder Woman do some badass swordfights was just top quality. And funnily enough, the chick who plays Jane from Doom Patrol plays Jessica Cruz / Green Lantern / Limelight from this movie, so that was a surprise. And it also reminded me why you don’t underestimate Green Lanterns!